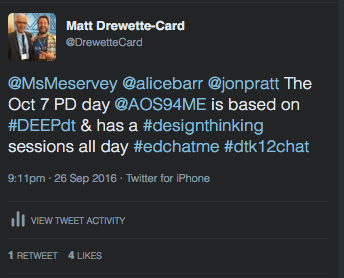 During this week’s #EdChatME discussion on “Building A Culture of Empathy,” I mentioned that I am currently working on designing a day of professional development happening Friday, October 7. The Norms are very much based on the EdCamp-style of norms. If a teacher is in a session for forty-five minutes and is satisfied with her work, she can get up and move to another session. This time for learning belongs to the teachers, and this time is precious. Teachers should not feel “locked in” to a session at any point. If it’s not working: go somewhere else. Learn and work with intention and purpose is a major theme of the day. Another major part of this day is ensuring that there is limited “Workshop Learning Loss.” We’ve all experienced this, and because this learning time is so precious and valuable, teachers should be thinking about which sessions they will attend that will intentionally and purposefully support their work, their needs, and provide them with the clarifications they need in supporting the goals of the district. Teachers will be required to submit an “Implementation Plan” after each session to explain how they will use what they have learned purposefully and intentionally, and this information will be added into their professional growth and effectiveness plans (aka teacher evaluations). They will be an important factor in aligning to our “Overall Professional Practice” standard that is a combination of all four domains in the Marzano Teacher Evaluation Framework. The core users for our professional learning environment are our teachers. By using an empathy-fueled model of designing the learning environments, we can make our environments more personalized, more relevant, more purposeful and more intentional. What do you think? I’d love to hear your feedback and/or ideas.